I love what-if stories that set the imagination free. Growing up in a small New England town, I spend many hours playing in the surrounding woods that ran along the small river that wound its way through the center of town. Often I would find myself on a summer afternoon hidden in a copse of oak and elms, no view of our house or the street. Then I’d begin daydreaming what this entire land must have been like before Columbus and the Europeans arrived. Indians, as we wrongly referred to them back then, had the entire North American continent to themselves; a vast empire of mountains, valleys, forests and plains as yet unspoiled by what some folks call civilization. As a teenager, I thought how truly magnificent that world must have been. Writer S.M.Stirling must have done much of the same daydreaming as the plot of this mammoth what-if adventure makes it possible for his characters to find that uncorrupted land. The book begins in 1947 when ex-Marine, John Rolfe returns to civilian life after having survived brutal combat in the South Pacific. He buys an old, long abandoned house in San Francisco and one night, while cleaning out its cellar, a blue shimmering wall of energy suddenly manifest itself in midair before him. Not one to shy away from a mystery, Rolfe soon discovers the blue wall is a portal to another Earth, one wherein America was never settled by Europeans. Rolfe immediately realizes the importance of his discovery and beings to hatch a wild, outlandish scheme to conquer this new land and there create his own government, his own social order, his own idealized world. To do this, he enlists several of his old war buddies and once they are brought to this “other” California through the dimensional gate, they are easily swayed by Rolfe’s dreams of power and wealth. The story then jumps ahead to the year 2009 (a neat twist as Stirling penned the book in 2003) and introduces a California Wild Life and Game warden named Tom Christiansen. Christiansen and his colleagues have stumbled upon an animal smuggling operation in Los Angeles. In the process of investigating the case, they find several rare animals thought to be extinct. The mystery eventually brings him in contact with the beautiful Adrienne Rolfe, the granddaughter John Rolfe, who attempts to divert Christiansen’s case by providing him with false information. The two become romantically attached and ultimately Tom and his pal, Roy Tully, uncover the truth about the “other” Earth and Adrienne has no choice but to abduct them and bring them through the gate. Once there, they learn that a descendant of the original families, Rolfe’s World War Two companions, is plotting a revolution to seize control of the gate and in the process the new world they have built for themselves over the past sixty-one years. Slowly Adrienne begins to win Christiansen’s support until he signs on as her ally to discover the truth behind the secret coup and then defeat it. Stirling is remarkably adept at world-building and he goes on for pages at a time explaining the history of this alternate world and John Rolfe’s new society. All well and good, as he wants to show he’s clearly thought it all out. I do appreciate that, but don’t wonder if a more critical editor, for the sake of narrative pacing, might not have found a few dozen pages here and there to trim. Christiansen’s indoctrination into this macho social experiment at times seems naively idyllic as when all the locals sign on to help harvest Ms.Rolfe’s wheat fields. It’s romantic fantasy to the tenth degree. Where Stirling excels is in his action scenes. These are extremely well written, taut and suspenseful. The last section of the book, when Christiansen must fall back on his warrior training as an Army Ranger in the Iraq, is superbly handled and had me turning pages fast. 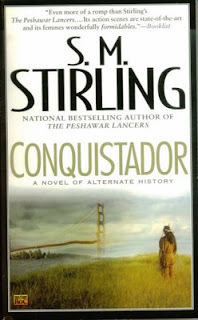 CONQUISTADOR is a big book with big ideas and not something you want to pick up for a fast weekend read. It will demand a hefty investment of time. If you are willing to give it, you will be amply rewarded for the effort. Just wanted to take a few seconds to let all of you fellow readers that I'm still alive and kicking. And I apologize for lack of a new review in a while. I am also a writer and editor and the past few weeks have been very work intense. Hopefully that is about to ease up and I'll have a new review up soon. And while I'm here might as well let you all know, I will be attending the Windy City Pulp & Paper show the 1st May representing my pulp company, Airship 27 Productions, along with my partner, artist Rob Davis. If you've never been to a pulp convention and live in the Chicago area, I urge you to give it a try. They are tons of fun. Okay, back to work, and as always, thanks so much for stopping by.